“My sister was crying as she watched me pack a year’s supply of tampons. 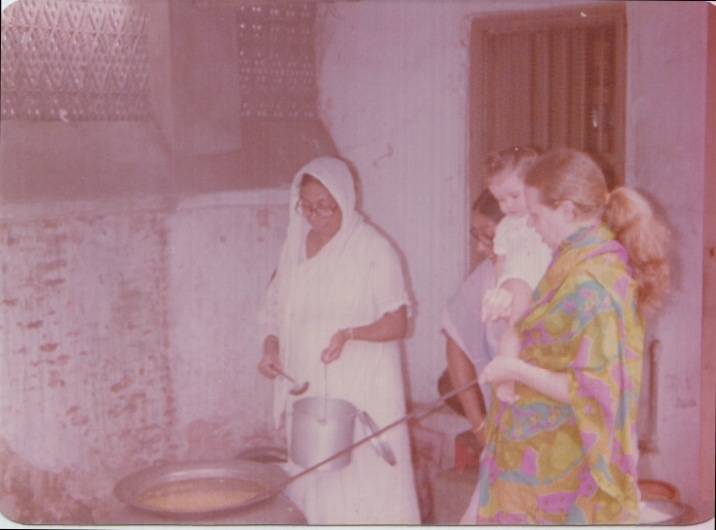 She couldn’t imagine why I wanted to go and live in Bangladesh,” said Kansas-born Susan Elahi. The tearful scene took place in 1980, in Saint Louis, Missouri, as a 30-year-old Susan was preparing to set off with her Bangladeshi husband for what was supposed to be a six month “adventure” in Dhaka. “It was all a great surprise to end up here,” she said with a smile. However as the mother-of-two reflects on her 32 year marriage, she glows with happiness and an enviable sense of contentment. Susan and Ehsan first met in Missouri in 1975, through mutual friends. “We realised we lived a block away, so we’d often go to the laundromat and do grocery shopping together. To help Ehsan get a rent reduction, I painted his neighbour’s flat. I made curtains too,” she said. Susan and Ehsan “did a tonne of stuff together” for about three years. “He was my best friend,” she said. However dating was out of the question, as neither was single at the time. “I was dating a stupid idiot and Ehsan had a girl who wanted to date him seriously… It took some time for the light bulbs to switch on in our heads,” she added with a laugh. And so the couple decided it was time for a sea change. When Ehsan and Susan arrived at Dhaka airport, every suitcase was meticulously combed by customs officials. She said it was routine at the time. “He’d only seen the mouse mattresses,” she added with a chuckle. Susan and Ehsan had left Missouri in March, when the ground was still covered by three feet of snow. 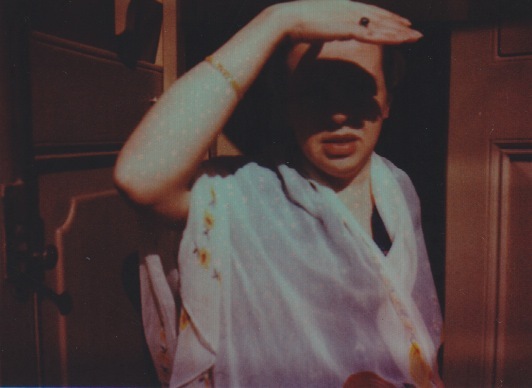 “I was dying of the heat in Dhaka,” she said. Needless to say, she’s well adjusted to it now. Prior to Bangladesh, Susan had made just one other international trip, which was to neighbouring Canada. Nowadays, the couple are regular jet-setters. Susan and Ehsan immediately moved into the Elahi’s 200-year-old home in Old Dhaka, where they lived for the next 10 years. The ceilings were 17 feet high, the walls were “hugely thick” and some of the original stained glass remained intact, along with a hall with louvered doors. As beautiful as her home was, Susan said that no one in Old Dhaka was spared the annoyance posed by monkeys. “They were huge and stole things,” she said. The sneaky critters even managed to open the jars of pickles stored in their pantry. As the monkey population increased, they became such a menace that local residents resorted to drastic measures. 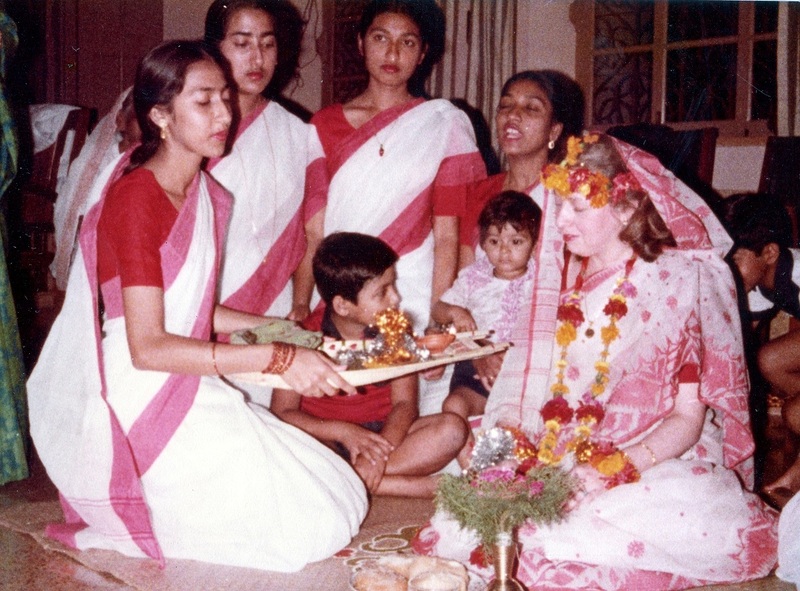 Susan’s “Gaye Holude,” which is one of several Bengali wedding traditions. It translates to “turmeric ceremony.” Photo courtesy of Susan Elahi. But surely wearing a sari restricted her movement, at least somewhat? It’s a beautiful image and one wishes that Susan, a talented painter, had made a self portrait of her child nestling in her ornate sari. 13 May 2014: Susan passed away yesterday, very unexpectedly. She died of a heart attack. May her beautiful soul rest in peace. My condolences to her family and close ones who loved her so. She passed away so early.she loved this country and its people. i went to dhaka in 1980 stayed 4 years. 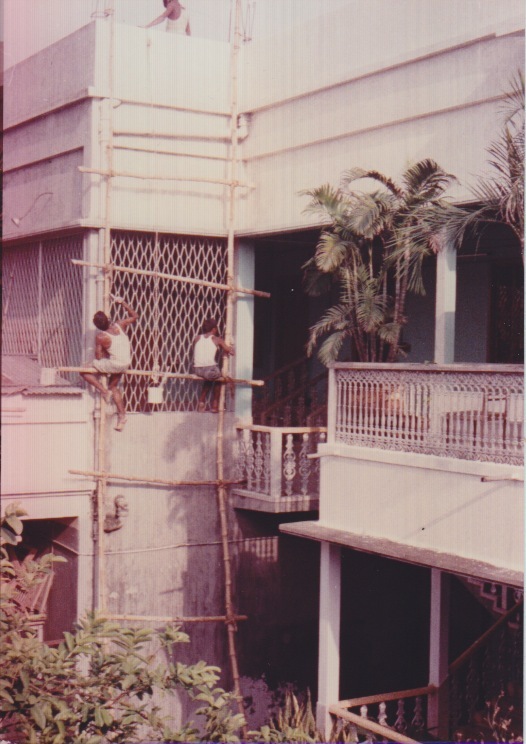 When visting my uncle’s house in old dhaka i can still remember those pesky animal’s running all over the rooftop’s. i think they still do!